What determines whether a child will ultimately become addicted to alcohol or other drugs? According to the National Insititute on Drug Abuse, many factors can add to a person’s risk for drug abuse. 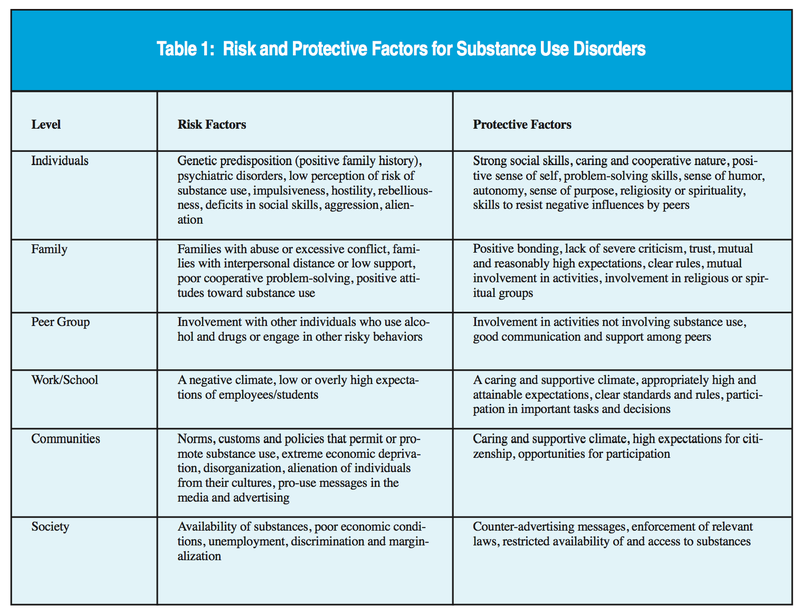 Risk factors can increase a person’s chances for drug abuse, while protective factors can reduce the risk. It sounds pretty logical, but what does that mean for your child? First, it is important to note that there is no crystal ball implied here. Just because a child is at risk for using drugs, does not guarantee that he/she will use drugs. In fact, research shows that most people at risk do not use drugs. Also, risk factors can be different for different individuals. That said, NIDA's research from the last two decades leads us to believe that more risk factors and fewer protective factors present is a formula for increased drug use. Risk and protective factors are often categorized under different domains: individuals, family, peers, work/school, community and society as a whole. Check out the chart below.